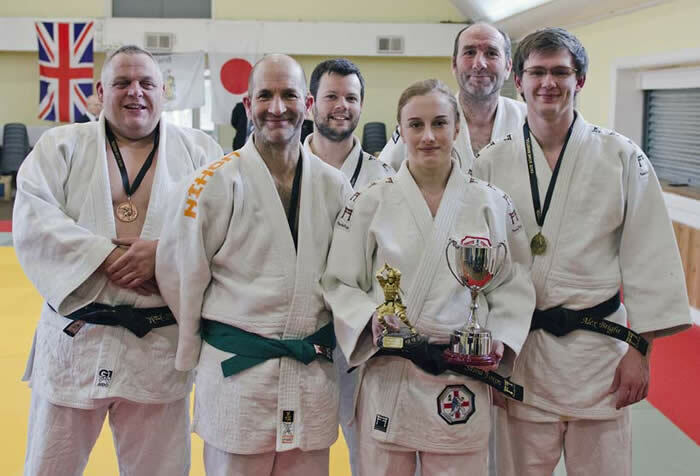 Well done to Alex on Winning the Bristol Closed Ne-waza competition, with Luke winning silver and Sasha winning Silver in the Women's category. Club Awards 2017. 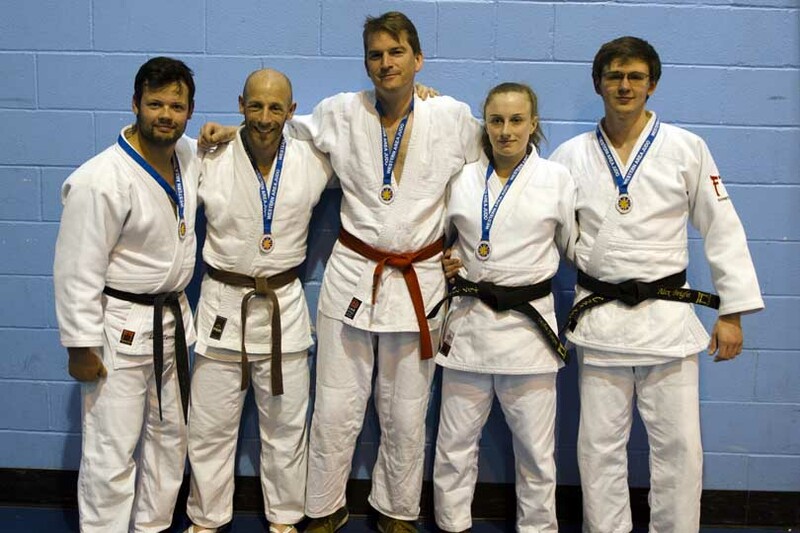 Well Done All..
What a medal haul we had; with two of our competitive players out injured we still managed 8 medals! Well done to Ollie C and Oliver B for enterting their first big event. Gold and Silver medallist have priority entry in to the National Schools event in March 2018. We have a British Schools champion! 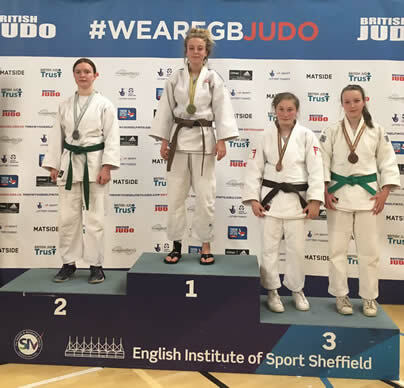 Not for the first time... Josie fought her way to the final with some outstanding judo and went on to win the final with a hold down to be the British Schools Champin for the second time! Josie is an execellent role model to our younger players, we have some players following in her footsteps. 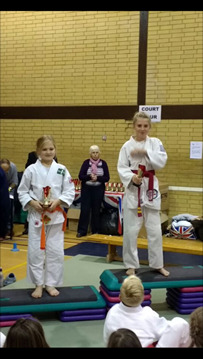 On day two Holly fought her way through a hard group to win a bronze medal, beating the Gold and Silver medallists from the area qualifier. Patrick was in one of the biggest groups, despite winning 3 fights and a tooth saldy mssed out on a medal. Izzy fought hard, having gone up a weight group, she too missed out on a medal. April 1 2017 - Interclub Champions! Next Interclub is 4 June at Yate Star. At Patchway we are an Inclusive club, to keep up to date with skills five of our coaches attended a regional Inclusion training course, to up date skills. It has been a few years since these were all on the mat at the same time, they were all about 6 or 7 last time, great to see them altogether! Can you spot them on the right? Well done and thank you to everyone who took part. Total of 305 lengths from the 3 lanes! From age 5 to Adult! Thank you to Phelpsie for sorting the pool for the 8th year! 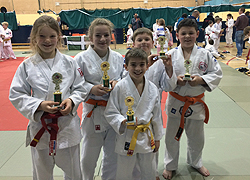 Well done everyone who took part in the Interclub and under 8 Festival, we were runners up in the Inter club trophy, well done to Bristol Judo on winning! 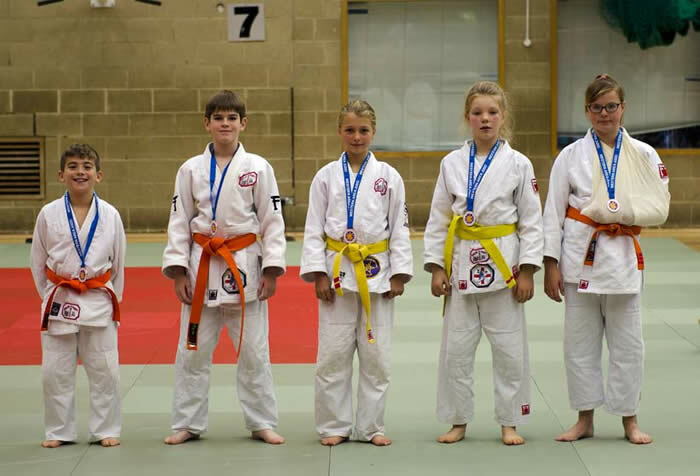 Gold for Holly & Stan, Silver for Oliver T and Issy, Bronze for Oli W.
Well done to Patrick and Holly at the NHC orange belt and below! Players from Patchway were invited on Sportsbar on BCFM 93.2 radio to talk about theirs and the club's acheivements. Mark, Steve, Luke, Sasha, Nick & Alex. 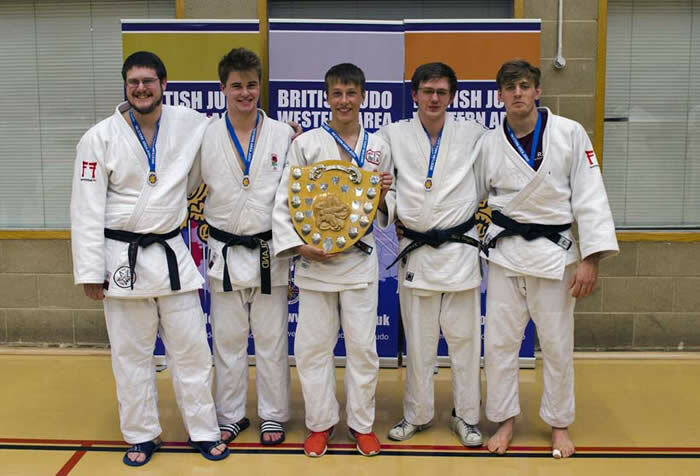 On Sunday 6 of our senior players took part in the Bristol Ne Waza competition at Yate Star Judo Club. Sasha retained her Bristol Women’s Champion title with ease. 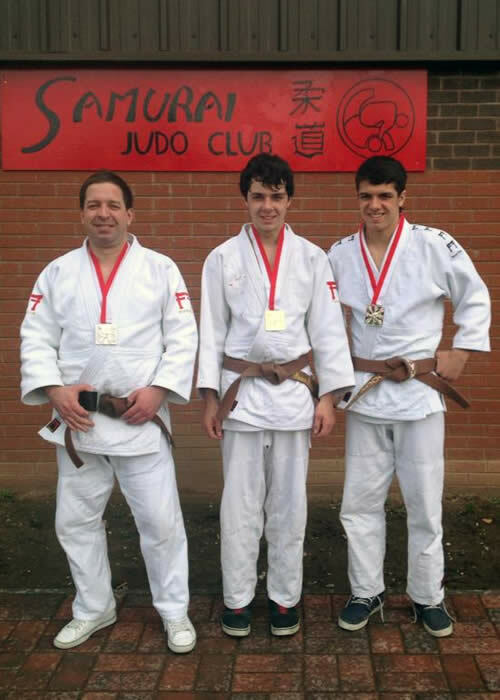 A special well done to Nick taking to the matt in his first competition for a few years…. Evelyn, Alfie & Kosei with their Minis player of the year awards. Fancy dress winners were adults, Simon Smith & Sarah Briscoe, children winners were Anisa and Matthew. Full house of medals for Team Patchway at the Gloucester open, Gold medal for Holly, winnng 3 fights, players of much higher grades. Bronzes for Liam and Patrick, it was Patricks first U16 competition, dealing with a change of rules! Well done all and thank you to coah Chris for supporting them. 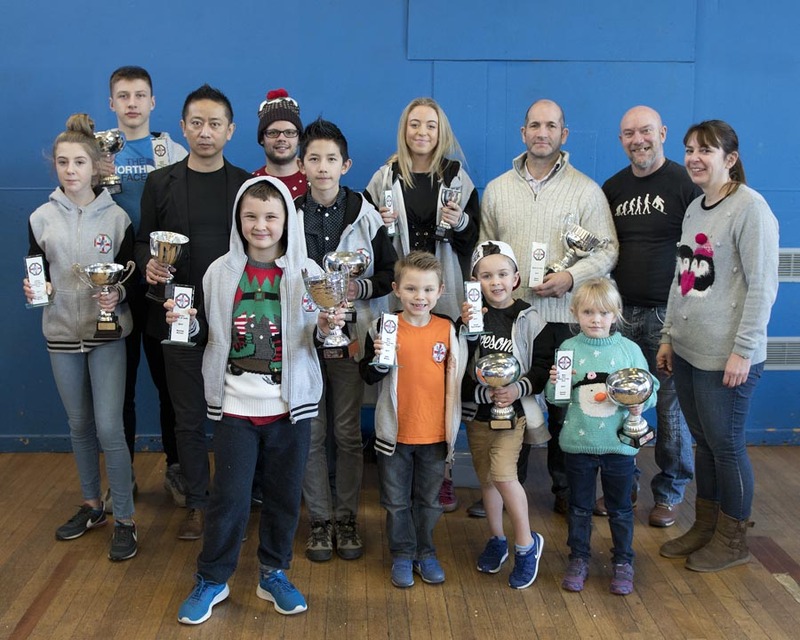 Well done to everyone who took part in the Yate interclub - YES we did it again, we've ended the year as Interclub champions! 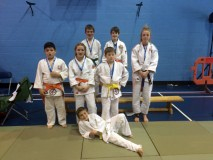 Gold medals for Issy, Holly, James & Stan (it was the boys first competition) Bronze medals for Molly, Ollie T & Michael. .
Well done to the two Bristol teams who fought at the Western Area Teams competition in Weston Super Mare on Sunday. Alex and Fin were in the Senior men team who won Gold and Isabelle and Patrick were in the juniour team who got Bronze. 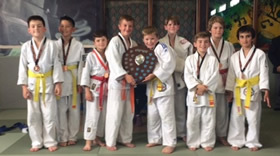 Smallest squad we've sent to an interclub all year, they still managed to come a close second for the interclub shield. Only fair we let another club have a turn! That was with out any under 8's. Bronzes for Duan and Michael. Next inter clun Sunday 6th November at Yate - see we need everyone out to win back the shield! We did it again! 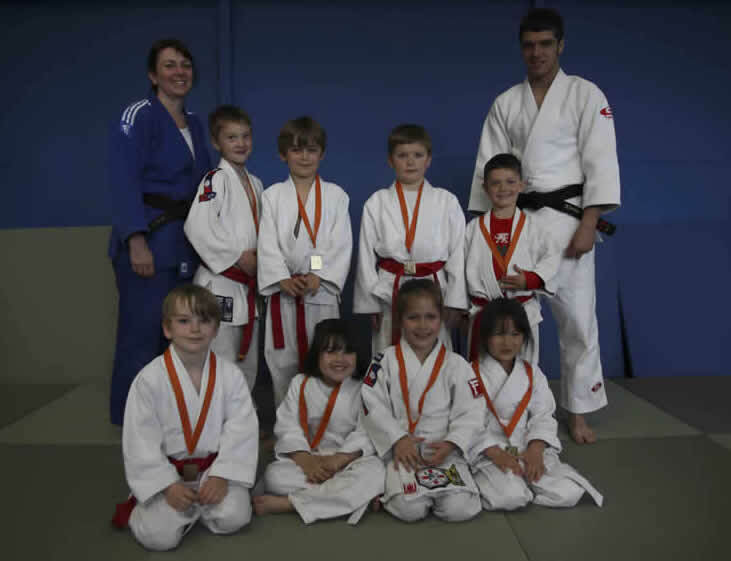 Our minis and judo players were out in force for our latest Inter club under training session and over 8 Inter club competition! Great performances from all! HUGE THANK YOU to everyone who took part and to everyone who made the event possible! Next Inter club Saturday 24th September at New Star. Bronze medallist Mack & 5th place Arthur. Club wins inter club trophy for the 4th time with a staggering 84 points! 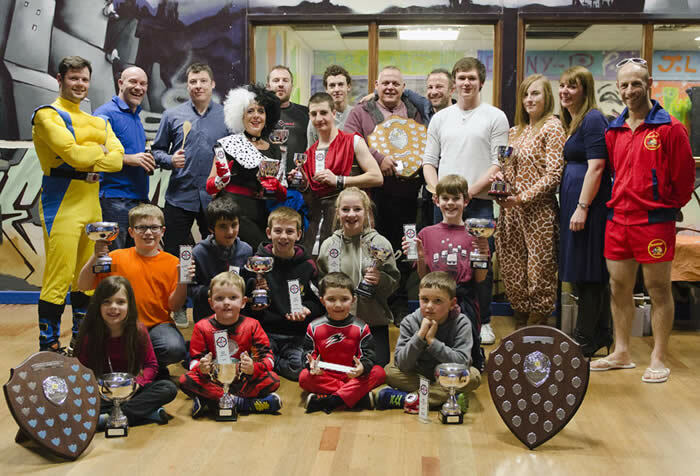 Well done to all the players who took part and a big thank you to everyone who helped on the day. We need to defend the trophy in Yate on 12th June. Our next inter club is 9th July. Welcome to our newest member, Willow Hardwell. It will be a few years before she is throwing her dad about on the matts. 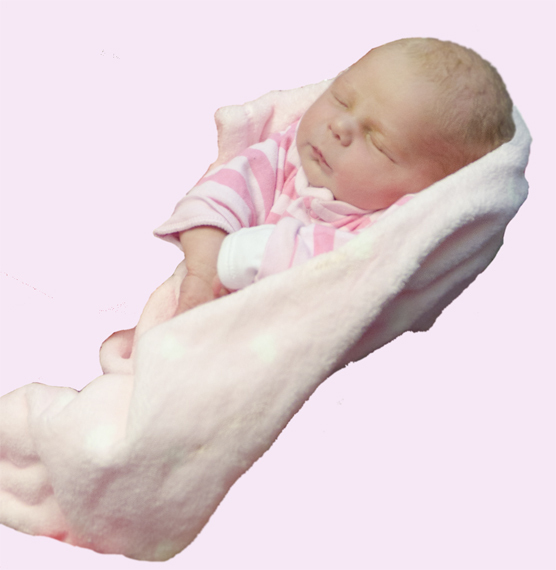 Congratulations to James and Amanda on the arrival of their daughter. Bristol Closed 2015 - We retained the Bristol Shield. 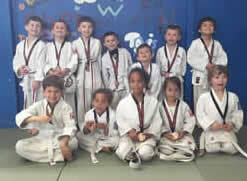 Our Under 8's and Over 8's at New star interclub, we came second in the interclub, well done all. We are doing taster sessions and a display at this event. After surveying who was about for judo on 29th August, we have decided to cancel the session and have a family picnic / BBQ at Blaise Castel instead. Going to meet from 12pm onwards, on the grass just up from the cafe, Luke is bringing a gazebo, if anyone else has one, please bring along. Toddy is brining BBQ and club is providing burgers/ hot dogs. If you can let me know if you plan to come so we know roughly how many to bring! We will take cricket / rounders etc for some fun the park. Hope to see you all there, everyone welcome, please spread the word. Judo is on as normal on. Thursday 27. 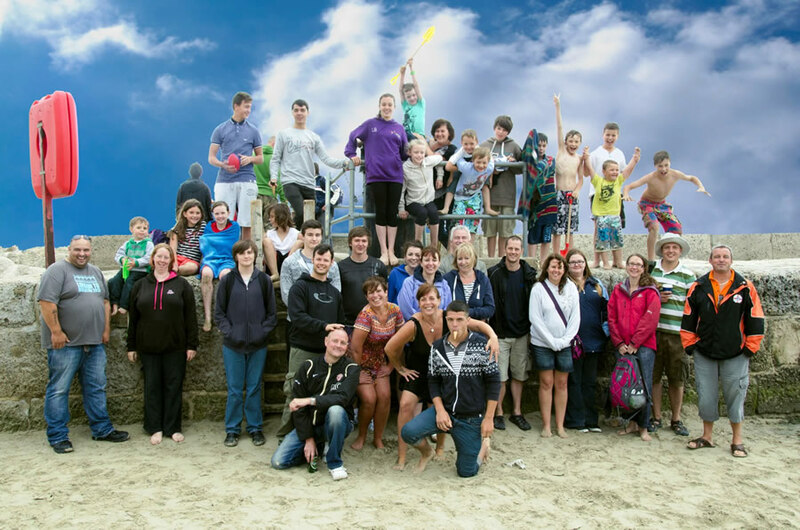 Over 60 players and their families went on a coach trip to Lyme Regis. 8 hours on the beach, playing games building sand castles, tunnels and nearly everyone went in the sea, at least for a paddle! Sunday 17th May saw us in Walsall for the Midland age band and seniors compaction. Well done to Kieran, Mark and Aiden for fighting on the day. Charlie Grades up to First dan. Charlie is awarded his Black belt. Well done.!. Chris presents Sasha with her belt after completing her first Dan Grading. A great team effort enabled us to win the Club Champions Trophy on Sunday at the first Bristol County Championship for a few years. Many of our players have secured a place fighting for the county at the forthcoming Western area Teams Competition from their performance the Championship. Emma, our treasurer today graded to 3rd Kyu. Luke took four of our young fighters to Crystal Palace for the Kent International competition. As usual it was a sunny day and the venue was very hot and humid. The standard was very high and all players fought very well. Well done to the u8's who took part in New Star U8's training and inter club. 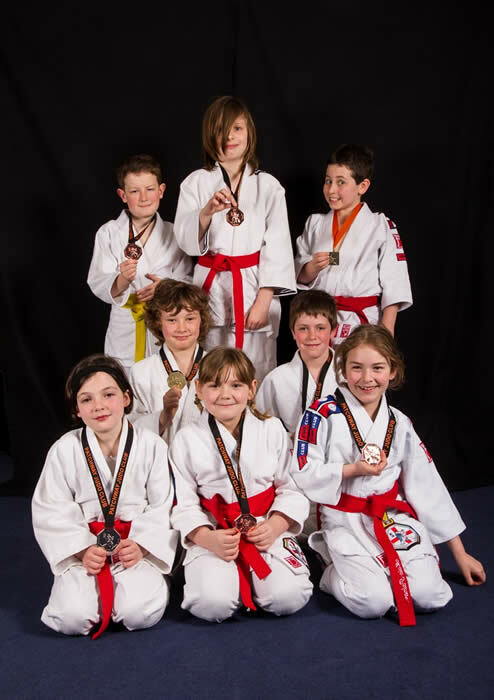 Especially congratulations to our two over 8's Oscar and Molly who both won all their fights and Gold medals in the over 8's. Thank you to the coaches, Alex, Alison and Luke and to Chloe and Ozzy for refereeing. Of course all the parents and siblings for supporting! 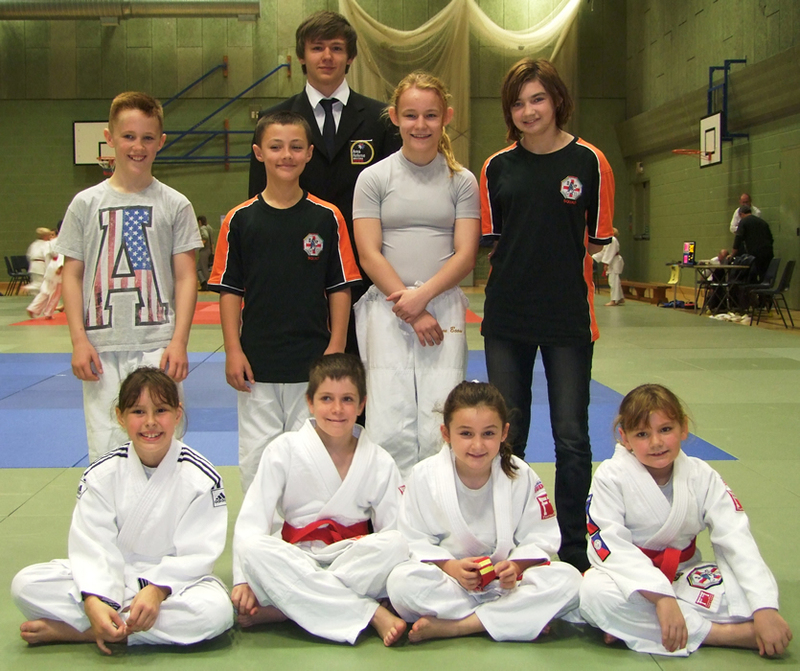 Harrison Groves, Josie Sparks, Finley Norton, George Burton, Oscar Norton, Jack Dobie, Charlie Plenty and Ellie Pleass. 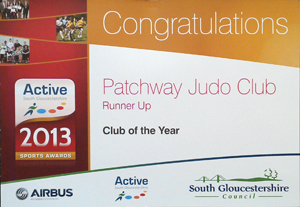 We attended the South Gloucester Council sports awards on Thursday evening at The BAWA Club. 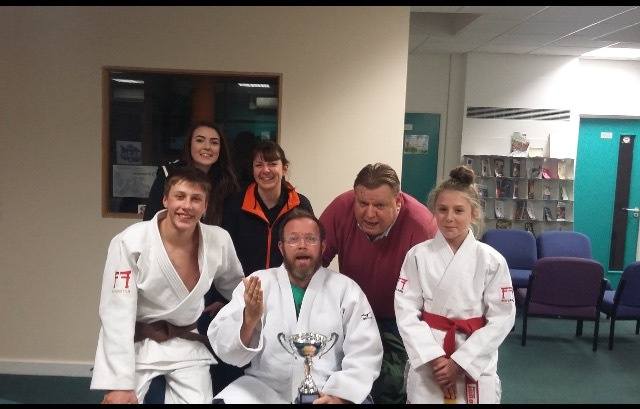 We were nominated for Sports Club of the Year award and were very happy to take Runner up position, a great achievement as this was across all sports clubs in the county, not just Judo. 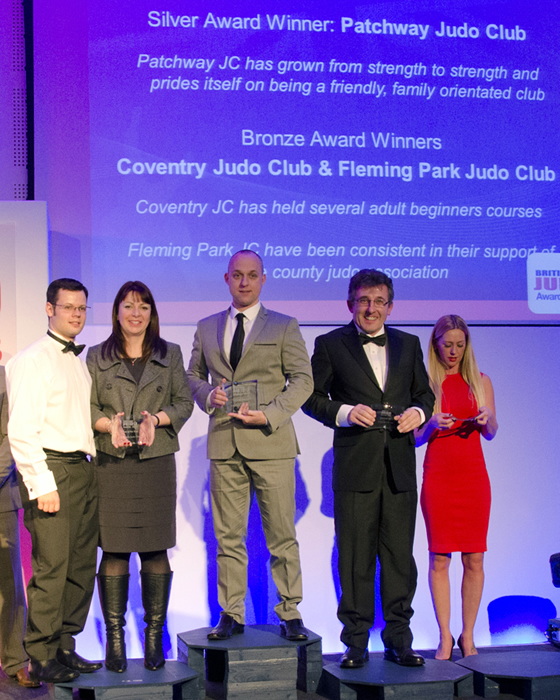 Patchway Judo Club wins Silver Award for Club of the Year at the annual BJA Awards. 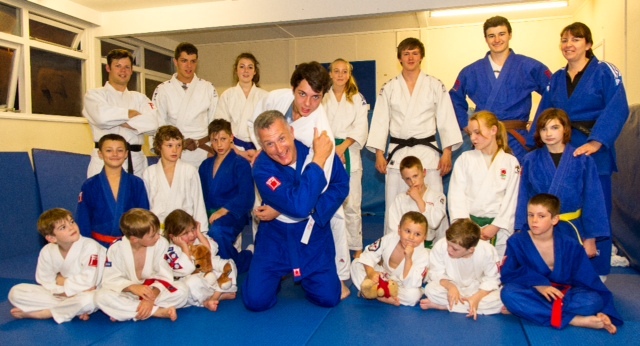 Saturday night saw a party from the club travel to ST Georges Park near Burton-on-Trent for the Annual British Judo Awards. We had a lot to live up to after last year’s awards where Alex and Emma both got Silver Volunteering awards. 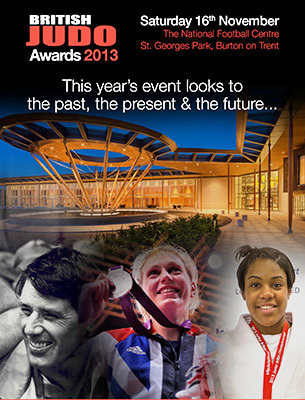 We were not disappointed, as a club we were nominated in the Club of the Year category. We were very pleased to be awarded the Silver award, a true statement to the clubs dedication and values. In the Young Volunteers category both Mollie and Reece were nominated and had got through to the final four. 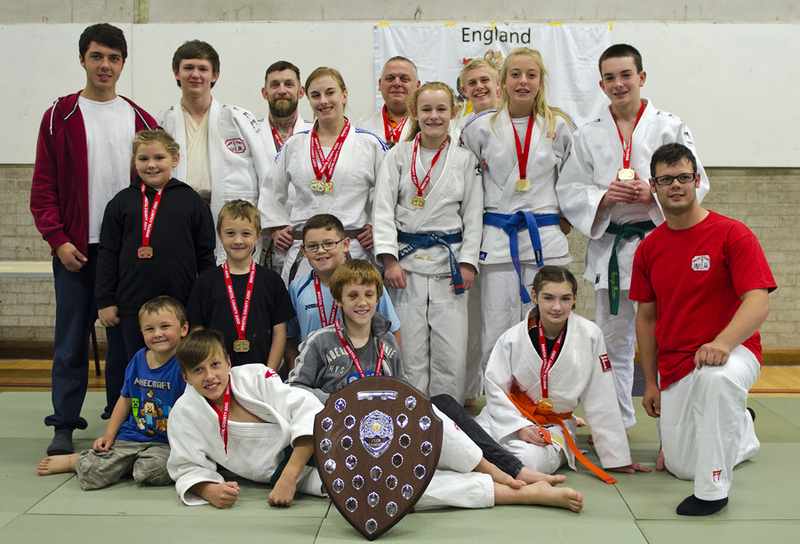 How proud we were to see Reece get Gold and Mollie take the Silver, showing the Judo community how our young players are prepared to give so much back to the club. Sunday 20th October so us take our biggest squad, since Bedminster open in June, to Somerset open in Glastonbury. All players fought very well, with Chloe and Josie also fighting players from the weight group above. 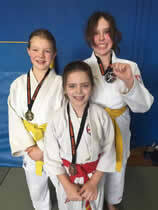 Medal tally, Gold and silver for Chloe, Gold Medals for Josie & Ozzy. Silver’s for Jack and Bethany. Bronze’s for George, Sophie, Liam, Imogen and Ellie. Well done all. Thanks to Alex for refereeing and Alison and Tony for coaching. As always parents, siblings and families for supporting! 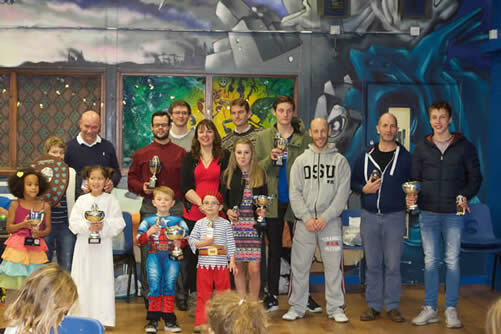 November 24th is Plymouth open, all our over 8, including youth & seniors, can enter that, so lets see if we can get an even bigger squad there. 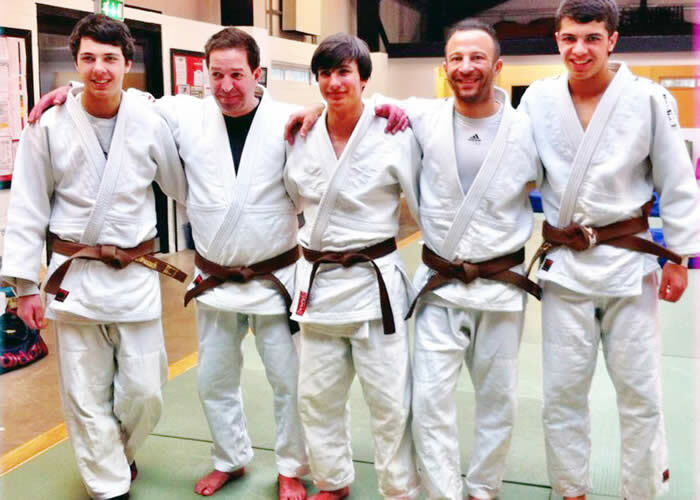 Ian happily put on a judogi (judo suit) and did some judo with the clubs players. from all over Great Britain, won 7 fights to be crowned British Champion. the group stages didn't make it to the quarter finals. As ever thanks to the coaches, Alison, Reece & Tony. In true Patchway volunteering fashion, Mollie, Emma & Alison were officiating! 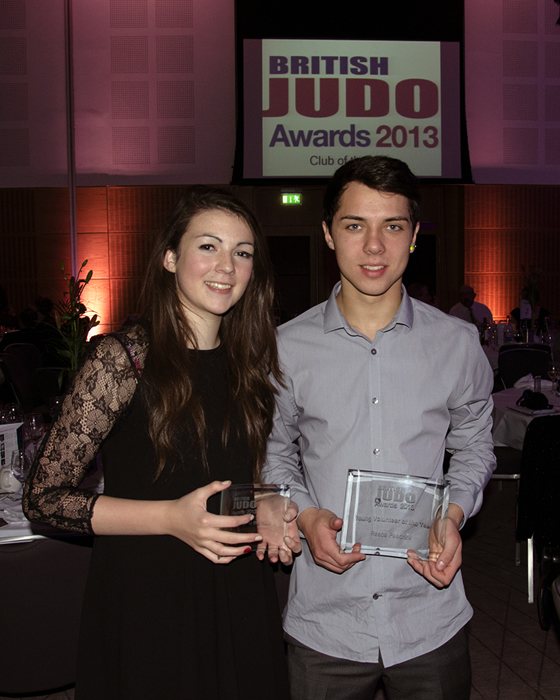 We are really proud to announce that not only has the club been shortlisted to the final four "Club of the Year" British judo awards but Reece & Mollie have both been shortlisted to the final four "Young Volunteer" award. 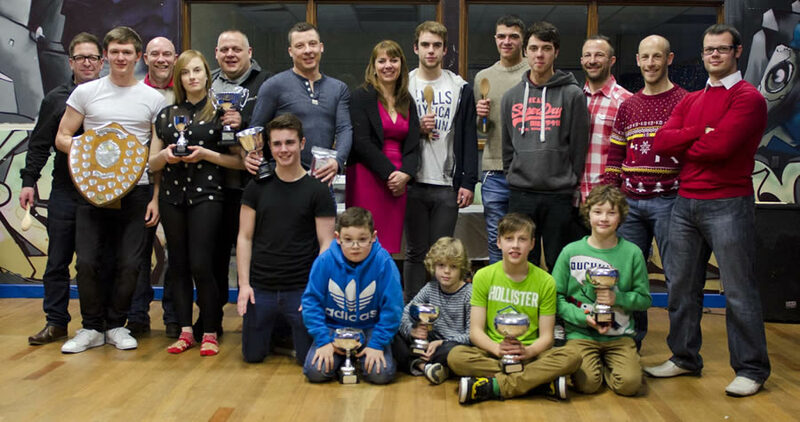 They follow in the footsteps of a long line of club award winning volunteers! Especially great that out of the whole of Great Britain we have two finalists in the same category, even more so that they are "young" volunteers. Fantastic role models to their peers and young club members. 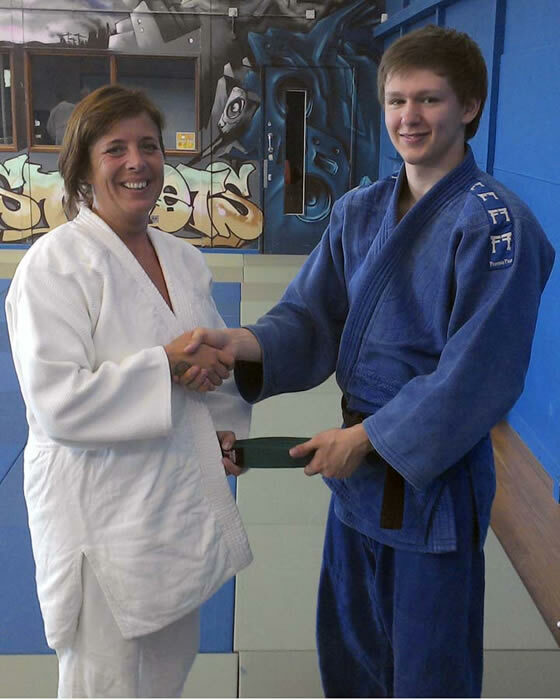 Reece Peacock became Patchway Judo clubs latest black belt in May. 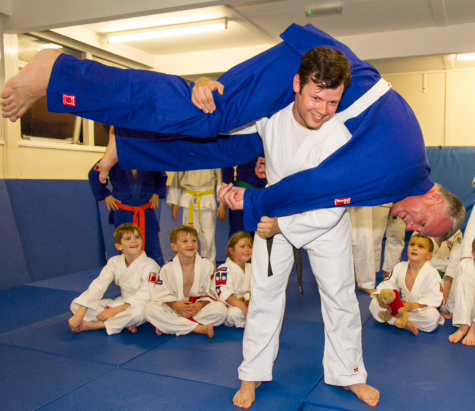 He started judo aged 8, was shortly joined by his twin brother Kieran. Both boys soon showed promise as naturally skilled players and went on to win medals at local, area then National events. Representing the club, County and Area in team events. 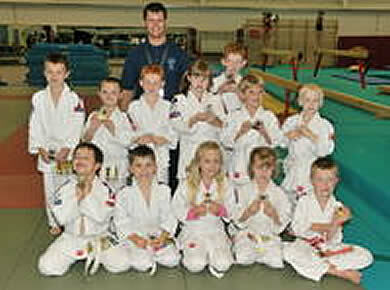 In 2012 Reece won a silver medal at the British judo Championships and was selected for the England squad. Reece had won all but 10 of 100 points needed to achieve his 1st Dan black belt through winning fights in competitions, he decided he would attend a grading to win the last 10; which he did this in his first fight. Not content with that he also went on to do a "line up". A "line up" is where a player fights three other players, their grade, one after another with out a break and by doing so achieves their Dan grade. 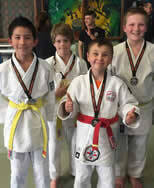 Reece successful won his line up; effectively winning his black belt twice in one day! Reece is also a Gold level junior referee and assists with coaching of the younger players at club sessions at Patchway youth centre on Coniston Rd and at the judo after school club at St Michael's school Stoke Gifford. 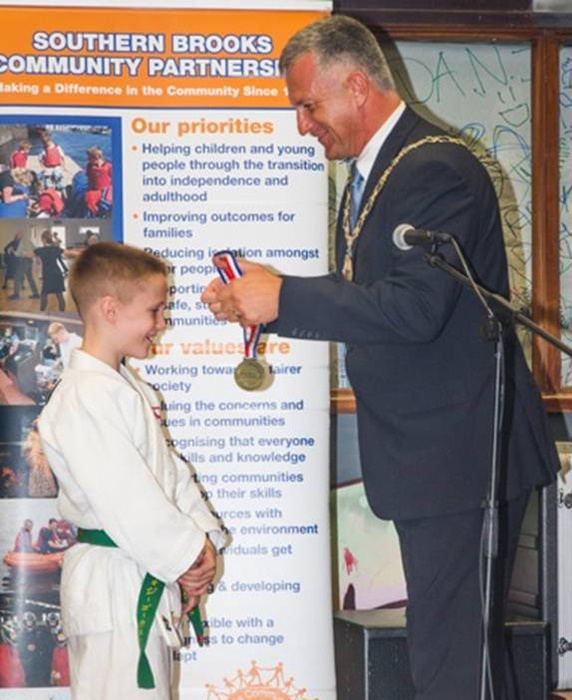 Reece being presented his black belt by Coach Chris Mockridge 3rd Dan, who was Patchway judo club's first black belt back in 1980's. 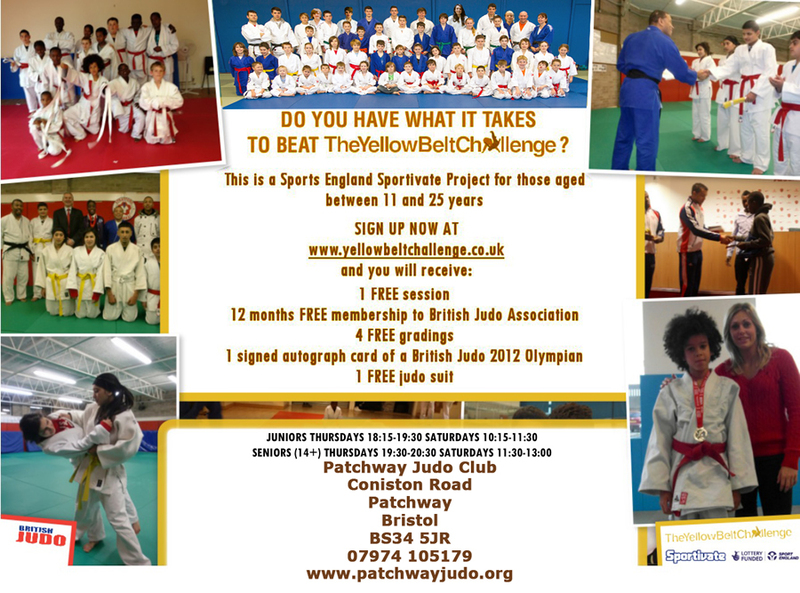 Patchway Interclub Red & Yellow belt and Club Training Session. 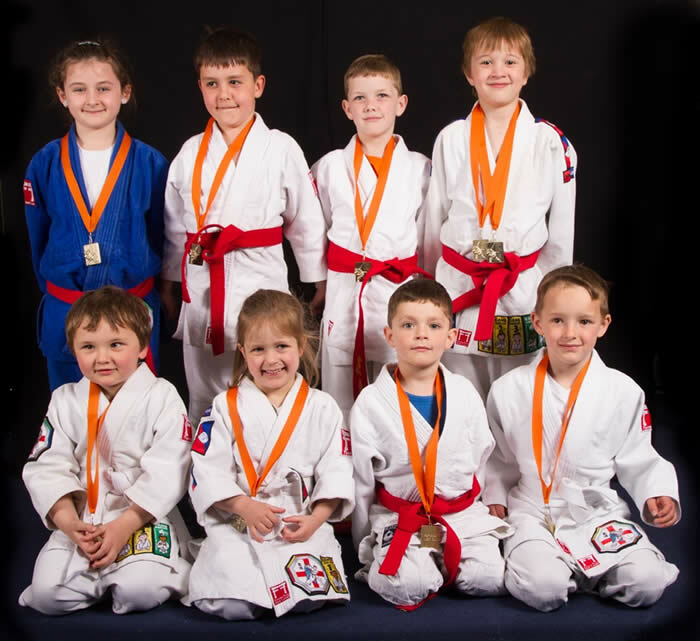 Well done to the under 8's who took part in the inter club training session with players from Bedminster judokwai, Bristol Judo, Long Ashton judo, New Star Seamills & Yate Star judo clubs. Congratulations to our over 8 competitors who took part in our Inter club competition today. Great performance from all the players; for some it was their first competition. The Coaching team very proud of all the players. Huge thank you to everyone who helped. In particular thank you to everyone who supported the event who didn't even have children taking part. Great to have such fantastic supportive families. Thank you once again to the learning grove for sponsoring the medals. Kieran, Reece and Gary were back at Samurai with the hope of gaining the points towards the practical side of their Dan grade. Reece won Gold, and 10 points, Kieran won silver and 30 points, Gary won silver, despite winning fights unfortunately didn't get any points. It won't be long before we see the number of Dan grades on the mat increase! Kieran, Reece Tony and Gary along with Henry from Bedminster, attended the Samurai Dan grade theory course. We are very proud to say that they all passed with flying colours with far more marks than the necessary 150 points to secure their first Dan theory! Well done to all! After a long journey to Sheffield on Friday our squad of 8 arrived ready to fight in the British Schools competition. It was a first time for Finley, Ozzy, George, Liam, Charlotte and Sam, Josie wanting to medal again as she had in year 6 and Chris wanting to beat last year. All players fought very well many winning some hard fights. Congratulations to Charlotte on becoming British Schools Champion, Josie on her silver medal, Chris on his bronze medal, Ozzy narrowly missing out on a bronze medal on penalites. Sam unfortualtey had to withdraw after winning his first fight with an injury. Well done to all the others. Thank you to Alex and Sam who were assisting Alison with the coaching, both did a stirling job. English open we were down to just Alex and Reece, Alex narrowly missed out on the crossover on penalites with the new rules. Thanks to everyone who donated clothers for Cash4Clothes we raised £54.40! Not bad from only a handful of families! If you have any old clothes please bring them to club! Don't forget Easyfundrasing - raise money without spending a penny, or by buying things online you would anyway! Sunday 10th February we hosted our 2 star competition at Abbeywood school. Just over 100 competitiors from 23kg to 130kg! All players were put into pools of nearest weight to give them chance to have as many fights as possible.Players came from all over England & Wales wit one player from Jersey. During the day not only players under the spotlight, also new referees. Well done to Alex Bright for passing his Area referee award and to Ryan "Mumbles" Guest for passing his bronze junior official award. Huge THANK YOU to all our helpers, couldn't have done it with out you! Also our Raffle Prize donator West Build for the super Hamper. Six club players took part in Referee and Junior official theory awards at Pill, practicals taking part at our own competition at Abbeywood and Interclub at Seamills. Congratulations to Alex for passing his Area Referee theory, Chloe for passing her silver junior official award theory and to Josie, Finley, Ryan, Ozzy & Liam for passing their bronze junior official awards..